Small ink stain on sleeve see picture. This is a cute 100% cotton top from Quacker Factory. It is navy and white striped with a V-neckline. There are "rhinestones" at the neckline. On the right side, there is an embroidered palm tree with a "rhinestone" trunk. Beautiful top with lots of Quacker Bling and Quality I’m selling lots of Quacker as my closet is overflowing. Designer: Quacker Factory. Style: Red Cotton Sequin Striped Front Design 3 Quarter Sleeve Top. Sleeve Length (shoulder to hem): 18. Length (collar to hem): 28. Shoulders (seam to seam): 16. Chest/Bust (armpit to armpit): 24. Quacker Factory. Scoop Neck. 3/4 Sleeve. Quacker Factory Embellished Pineapple Top Striped design Embroidered beaded motif on the chest Contrast piping on V-neck 3/4 length sleeves Cotton pique knit Style number A46136 This piece has been altered. 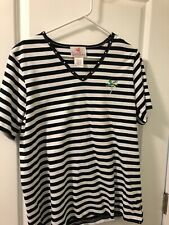 Size: Tag-XLarge Actual-Medium Use MEASUREMENTS to verify fit Colors: Green White Fabric Content: 100% Cotton Measurements: All measurements are un-stretched Bust-39" Waist-39" Hips-40" Sleeve(midneck/cuff)-22" Underarm/cuff-11" Shoulder/hem-26" Condition: Very Gently Used No holes, rips, stains or loose stitching. Un-faded colors with no transfer to lighter areas All buttons, button holes, hems are undamaged. Check out our store for other great items; and remember, we combine shipping on multiple purchases. I will always get back to you as soon as possible. Black white stripe with embellished design. Quaker Factory 3/4 sleeve knit top. Condition is pre owned with normal wear. It is a woman's size L. Material: 60% Cotton, 40% Polyester. Sleeve: 17" (43 cm). Length: 26.5" (67 cm) Shoulder to Hem. Quacker Faktprlbots ~. Sequin Detail Palmtree. Pullover Blouse. 3/4 LengthSleeves. Colors are navy blue and white stripe with a red sequin anchor. length, shoulder to hem: 30". 2 PC SET- SIZE 3X- SLEEVELESS BLOUSE AND MATCHING JACKET WITH 3/4 SLEEVES. PINK, BLACK, WHITE, YELLOW. RHINESTONES THROUGHOUT. EXCELLENT CONDITION. SLEEVELESS BLOUSE TOP CENTER OF NECK TO BOTTOM OF SHIRT: 29 1/2" LONG. Quaker Factory. Length mid-shoulder to hem:29". Sleeve length shoulder seam to sleeve cuff:24". Quaker Factory Size Small Teal/ White Stripe sequin Umbrella In Sand Top, Chest 20"W, Length 26"L.
Suitcase survival kit. From Quacker Factory. 3X(26W-28W). Machine wash, tumble dry. 60% cotton/40% polyester, exclusive of decoration. This vest is very flattering, comfortable and perfect for any wardrobe. We can resolve any issue. Circle back. Mix it with white or bright jeans for a casual pairing with panache. From Quacker Factory(R). Machine wash, tumble dry. An honest mistake is an honest mistake. I try my best to describe all the details. No major flaws. Normal wear. (COLOR TONES MAY VARY DEPENDING ON YOUR MONITOR/DEVICE SETTINGS. ALSO THE LIGHTING I MAY USE COULD MAKE IT LOOK LIGHTER OR DARKER ON YOUR END). BLUE AND WHITE STRIPE. LENGTH (SHOULDER TO BOTTOM HEM): 26.5". HEARTS ON FRONT STUDS SEQUINS AND RHINESTONE. I NEVER SEND AN ITEM TO YOU INTENTIONALLY WITH A FLAW! • Style # A230735. • Item features 3/4-length sleeves, sequin and lace design. Relaxed fit. • 100% Nylon Lace. • 60% Cotton, 40% Polyester. • Chest 19.5”. • Hand wash, dry flat. Color: Gray with Silver Sequins. Condition: Pre-owned. No signs of wear. Length: 24". Neckline: V-Neck. Shirt has Pockets. EUC without flaws. Size Large. 100% Cotton. Chest - 44". Waist - 43". Sleeve Length - 17.5". From Quacker Factory(R). Fit: semi-fitted; follows the lines of the body with added wearing ease. Length: missy length 25-1/2". Set sail for sunny style with this adorable Quacker Factory T-shirt, decorated with a fun anchor charm dangling inside of its keyhole neckline. From Quacker Factory(R). Features: striped, keyhole neckline with anchor charm decorated by clear stones, 3/4-length sleeves, side slits at hem.